In an effort to build a better transit experience, Metro transit is constantly monitoring and reviewing feedback from our passengers and operators. 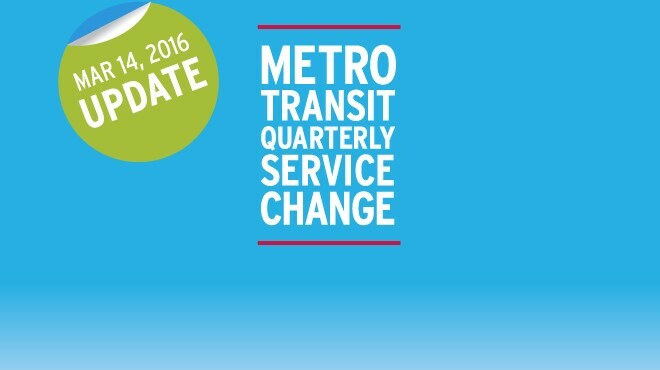 As a result, every quarter Metro makes service change updates to MetroBus routes and schedules in order to meet our riders’ needs and to improve MetroLink connections and MetroBus route performance. View new schedules, maps and the latest changes coming to your MetroBus route. The next quarterly service change is scheduled to for Monday, March 14 and it will impact the operations of 48 MetroBus routes in the St. Louis metropolitan region, including the introduction of nine new MetroBus routes and discontinuation of service on eight MetroBus routes. MetroLink will not be impacted by the quarterly service change. A good amount of MetroBus changes will occur in North St. Louis County, with the introduction of a new and completed redesigned MetroBus service plan. March 14 will also be the first day of service for the North County Transit Center. This new transit center, located at 3140 Pershall Road between West Florissant Avenue and New Halls Ferry Road, will offer passengers an even better transit experience with new amenities and features, including: public restrooms, indoor waiting area, security, digital arrival time display boards, a few Park-Ride lot and a cafe (slated to open sometime this summer). Visit metrostlouis.org for more information about the March 14 service change. If you have any questions, email customerservice@metrostlouis.org or contact Metro Transit Information at 314-231-2345 or 618-271-2345, Monday-Friday, from 7:30 a.m. to 4:30 p.m.
I’d like to bring attention to the amount of trash I’ve noticed along the MetroLink lines, particularly around the Rock Road station. It makes the city of Saint Louis look neglected and environmentally irresponsible. I wonder what visitors think when they step onto the Metro from the airport and their first glimpse of St. Louis is of trash and neglect. Leah, thank you for bringing this to our attention. We’ll make sure our maintenance team reviews your feedback. I would like to know a little more about why part of the downtown route is changing for the 410X Eureka Express. The A.M. route down 7th Street (instead of 9th street) makes the drop-off of two of your largest employee customers in that area further away from their destination (AT&T and U.S. Bank). I am aware of why some of the parts of the route changed, but this part baffles me. Tom, some downtown MetroBus routes are being rerouted in anticipation of the temporary closure and renovation of the Civic Center Transit Center sometime this spring. In the case of the 410X Eureka Express, Metro has decided to use 7th and 8th Streets instead of 9th and 10 Streets. The city has reconfigured 9th Street and as such it is very tight for buses to travel on. We apologize for the inconvenience and will make sure your feedback is sent to both Customer Service and our Planning Department for further review. If you have any further questions, please feel free to call Customer Service at 314-982-1406.